Pistachio. May contain traces of NUTS. Pistachios are a delicious and nutritious snack that contributes with more than 15 essential nutrients, including antioxidants and fiber, and plenty of plant proteins in itself. They are also known as green almonds and are mainly located in the Middle East. The Iranians call the small fruit lovingly "laughing pistachio" because their light cup sideways jumps before the age of maturity on the side. A delightfully friendly snack that should not be missed as part of a full and healthy diet. 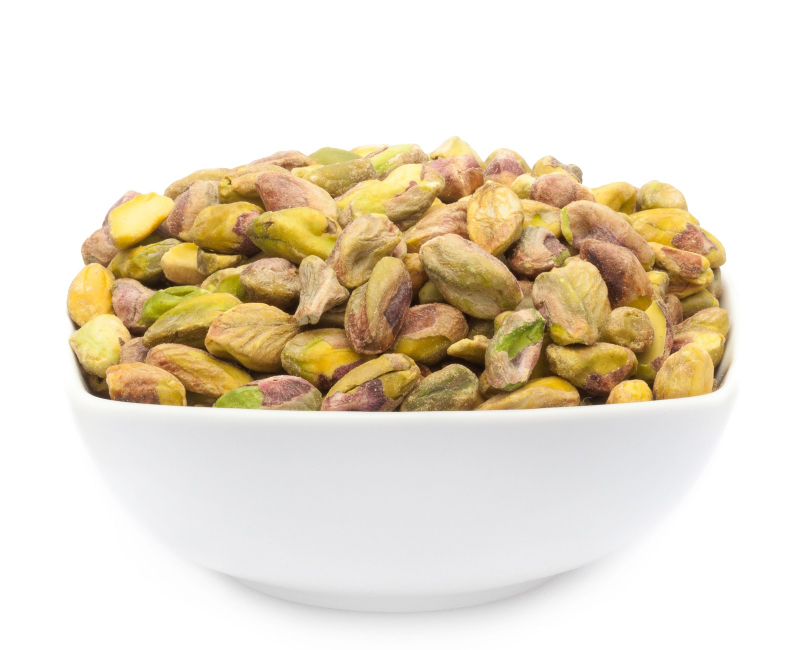 Our natural GREEN Pistachios feature a mild nutty and aromatic nature and are already peeled and ready to eat can be nibbled away. The beautiful colours of natural pistachios says something about their ingredients. Antioxidants and polyphenols can be detected with the green, yellow and purple hues in the core. All important nutrients that make the pistachio as a dietary supplement tremendously valuable. Pistachios are thus only a smart snack that pierces one with its natural colour variety and amazing, but a healthy block which should find a place in the daily diet. Our GREEN Pistachios are always a good choice when it comes to the You want to recharge your energy reserves quickly and effectively. A few seeds a day and you have a need for vitamins and fiber is plentiful covered. In addition, they simply taste very soft, sun and more. Completely natural are GREEN Pistachios a healthy and nutritious snack that like to accompany you through the day. The slightly buttery flavour and delicate aromatic core let you enjoy this completely natural pistachios without additives without feeling guilty. Daily a small handful of reducing the rise in blood sugar levels, which makes turn reduces the feeling of hunger and appetite regulated. You will always have tangible, makes it a faithful companion in everyday life. Scattering them in your cereal or yoghurt or nibble them just for the fun. Due to their beautiful colouring make them also very suitable as a decoration placed on any dessert, cake or ice cream. Classically one enjoys it into cheese with grapes or dried fruits.